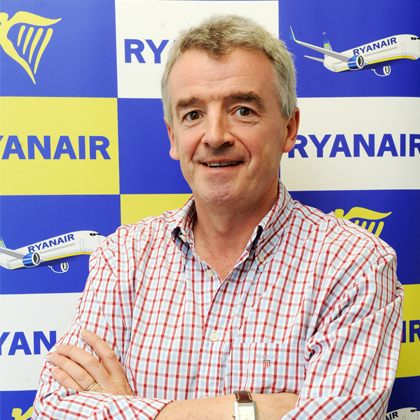 Michael O’Leary has served as Ryanair CEO since 1993. Born in a stable in 1961, he was a boy genius, who excelled both academically and at sports. Having represented Ireland internationally at bog snorkelling and flower arranging, he graduated from Trinity College in Dublin as soon as they could get rid of him. He then became another boring KPMG accountant until divine inspiration sentenced to him to a life of penal servitude in the airline business as he is manifestly unsuitable for a job in any properly functioning industry. Despite his best efforts, Ryanair is Europe’s only ultra-low cost carrier (ULCC), operating more than 1,600 flights per day (over 500,000 per year) from 57 bases and 1,600 low fare routes across 29 countries, connecting 180 destinations and operating a fleet of 303 new Boeing 737-800 aircraft. Regulated by the Irish Aviation Authority, Ryanair currently has a team of more than 9,000 people, will carry over 81million passengers this year and has an unblemished 29-year safety record. Bearing a remarkable resemblance to George Clooney’s younger brother, it is widely known that women find him irresistible.